Warning...this post is long. Really long. In fact, it might be the longest post I've ever published. But, that's OK I think, because it's literally all about beer. Untapped beer, to be exact. You know, the kind of beer that gets served at a certain beer and music festival that comes to North Texas twice every year. Of course, being that it's spring, that means we're talking about Untapped Fort Worth. 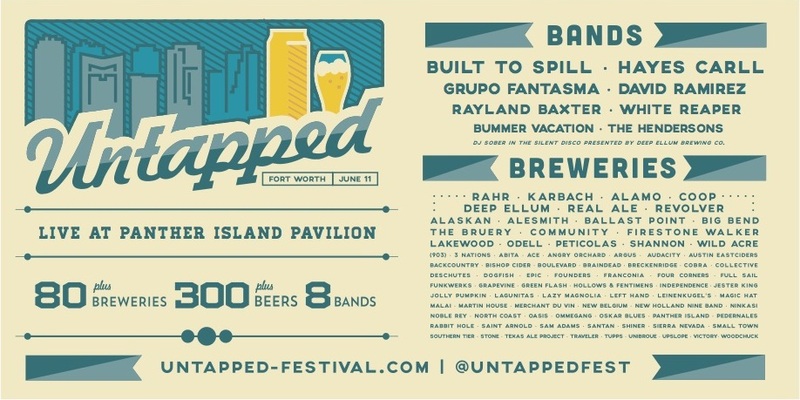 Now in its fourth year, the Fort Worth edition of Untapped returns to Panther Island Pavilion for its fermented brand of festivities on Saturday, June 11. With it comes list of over 300 beers from more than 80 breweries, half of which are from the Lone Star State. Within "the list," as I've referred to Untapped unveilings in the past, you'll find close to 100 IPAs, 22 barrel-aged beers, 22 sour/wild ales and 20 ciders. You'll also notice that breweries that like Alamo, Big Bend, The Bruery and COOP Ale Works will be serving beers that are new to the North Texas market. And speaking of new, there are debut beers on the menu from the likes of Real Ale, Revolver and others, not to mention a collaboration beer concocted by Jester King and Tired Hands, as well as another involving Sierra Nevada and five other breweries. Heck, there's even a beer from North Peak that'll challenge you superstitious sorts with its 66.6 IBUs and an ABV of 6.66%. Oh, and let's not forget, there's music involved in this thing too, with eight bands on the bill headlined by Built to Spill and Hayes Carll. They'll be joined by Grupo Fantasma, David Ramirez, Rayland Baxter, White Reaper, Bummer Vacation and The Hendersons for a day that will no doubt become 'Local Legend', and one that'll surely be worthy of a 'Staycation' in 'The Fort Worth' area. Tickets for Untapped Fort Worth are on sale now (click here to purchase), with prices ranging from $35 for General Admission (concert only with beer sold separately) to $119 for the all-new Stout Package. The latter provides VIP early entry and access to the Untapped Clubhouse, which includes side stage views, upgraded restrooms, a private bar and complimentary food from Brewed, Chipotle, The Common Table and Malai Kitchen. For more information on Untapped, visit the festival website at http://untapped-festival.com/ftw/, and for the most up-to-date beer list (i.e. in case of last-minute changes to what's shown below) go to http://untapped-festival.com/ftw/brews. A year ago at this time, Rockwall was a Dallas suburb without a brewery. In a matter of weeks, though, the city's brewery count will be two after the long-awaited arrival of Hemisphere Brewing Co. Ask founders Ruben Garcia and Brandon Mullins about their journey, and the first response is likely to be a sigh and a shake of the head. It's taken them five years to get to this point, with seemingly one obstacle after another getting in the way. And, while they've settled on Rockwall as Hemisphere's home, the path to opening their brewery actually began in another city. "We originally planned to open in Richardson, but for a variety of reasons it just didn't work out," says Mullins. "Here in Rockwall, though, things seemed to fall in place a little easier and we felt like there was some amount of progress right away." Yet, despite closing on the brewery's location in 2014, it's taking them another two years to finally see the light at the end of the tunnel. Part of the reason is that they are handling renovations to the interior and exterior of the structure themselves, while another is simply a matter of working through city and county requirements like anyone else. That's why, even now, they aren't ready to commit to an opening date beyond saying that'll be early summer. Another factor is that pesky licensing process, which for them is now nothing more than a waiting game, but as soon as that completes they'll fire up the brewhouse and start building up a stock of beer. 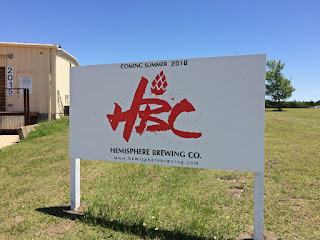 On that note, Hemisphere will be working with a combination of equipment obtained from 903 Brewers in Sherman and the now-defunct Texas Big Beer Brewery of Buna. The brewery will employ a four-barrel system for production, with the operation being draft-only for the time being. Packaging is something that's in the long-term plan, but at least initially, Hemisphere will spend its time and resources on building the brand and getting beer to market by way of draft accounts. doors that open to the front. An additional door will lead to an outdoor beer garden in the back. Product-wise, Hemisphere will launch with six beers, though which styles will be available on opening day has yet to be decided. Garcia and Mullins are hoping to differentiate by offering types of beer that may be under-represented as part of their portfolio, which will otherwise remain flexible with no hard and fast rules as to how long any given beer will be made available. "We'll have an IPA and other approachable styles," says Mullins, "but we also plan to take advantage of our small-scale system to do a lot of experimentation. With that, we'll reserve one or two handles in the taproom for brewery exclusives and recipes where we'll be looking for consumer feedback to help decide if something is worthy of wide release. Beyond that, we may or may not have year-round beers, it just depends on consumer demand." The creativity aspect, in fact, is what got Garcia and Mullins interested in opening a brewery in the first place. Both are musicians who've been homebrewing for about 10 years, and from time spent doing both, they see a philosophical parallel between the art of making music and the art of making beer. So, as they see it, the brewing process represents another way to express themselves. "There are layers to a song just like there are layers to a beer," explains Garcia. "And, in both cases, it's all about putting all the pieces together and coming up with a great finished product. Whether it's beer or music, you want to be proud of what you make and you want to share the passion that went into it with others." "Plus, for us it's that constant need for a creative outlet," adds Mullins. "It kind of goes along with the idea of idle hands when you get right down to it. When we're not writing music, we want to be making beer." Regarding Hemisphere's location, the company's 3200 square foot building sits right across the street from Woodcreek Brewing Co., which should make the spot a destination for anyone looking to drink local beer in Rockwall. Of course, being located on the far eastern edge of the Metroplex also means trying to find ways to get people from Dallas and beyond to want to come out for a visit, but that's something the founders are keeping in mind as they design the space. "Whether you're having a beer at the bar, or hanging out in the beer garden we'll create out back, we want the space to have a relaxed, chill vibe," says Mullins. "I mean, if you're going to make the drive, it outta be worth the trip. So, hopefully we're able to create an atmosphere that makes people want to stay a while." 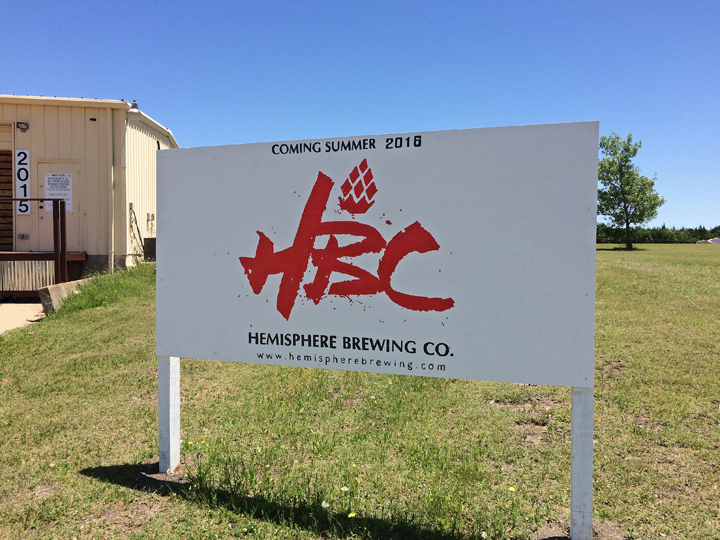 As alluded to above, federal (TTB) and state (TABC) licenses are still pending for Hemisphere, but once obtained the brewery expects to be open for regular taproom hours, both on select nights during the week and on weekends. Image credit: Go Oak Cliff/Dowdy Studios. At least here in North Texas, there aren't many beer-centric events that can lay claim to having been around since before the current craft beer boom got started. In fact, given that we're talking about anything that debuted prior to say 2011, you don't even need whole handful of fingers to count the few that qualify for such a characterization. Were we to make a list, we'd find that one of those in question has to do with a bunch of knurds and some kind of feast, while a couple of others are built around the amateur brewer in all of us. 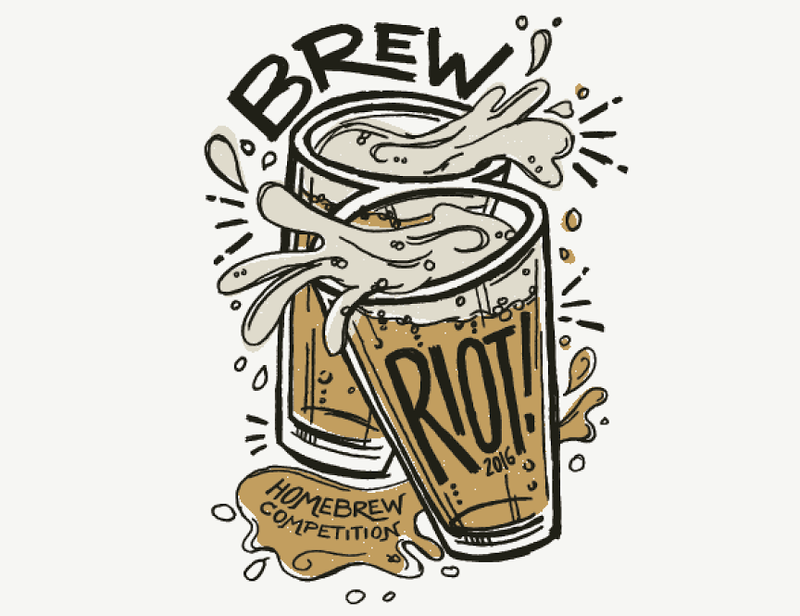 Indeed, homebrewing competitions like The Bluebonnet Brew-Off and Brew Riot are among the longest-running industry-related events in our history. But, that sort of makes sense if you think about it, considering that the craft beer movement has its origins in the homebrewing community. If not for homebrewers seeking to make a better brand of beer than what was being offered by the "big three", we probably wouldn't be having this conversation in the first place. As for Brew Riot, this year marked the eighth annual edition of an event that has called the Bishop Arts District home from the time of its inception in 2009. Since then, many brewers have taken their skills to the next level after having first sampled their beers from behind a booth at this popular beer festival. Four Corners traces its history back to Brew Riot number one, while later years have seen pre-opening samples being poured from the likes of Peticolas, Lakewood and others. In 2015 alone, three alumni made the jump to the professional ranks, with Oak Highlands, Noble Rey and On Rotation opening new breweries last year. So, who's next? Well, as of now, we know that The Manhattan Project will begin production in October after entering into a joint proprietorship with Bitter Sisters in Addison. We also know that Steam Theory plans to open on Lower Greenville later this year, adding their name to the roster of brewpubs that make their home in the City of Dallas. Beyond that, though, it's anybody's guess. Maybe it'll be long-time participants like Grotto, Knowles Brothers, Mossberg or Mox Nix. Or perhaps it'll be someone we aren't as familiar with like The Fort or Dirty Job. Then again, it could be a group like Oak Cliff Brewing. They came out of nowhere in early May with sights set on a location, only to be derailed because of something to do with a sewer line. 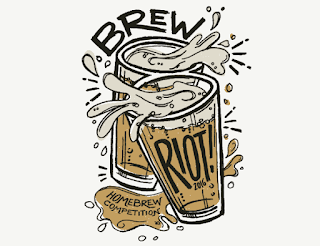 In any case, it's fun to speculate about who among Brew Riot participants might be the next North Texas brewer, and better yet whether something they served might one day be the next great North Texas beer. And, at least for me, that in a nutshell is what keeps me coming back to Brew Riot year after year. Knowles Brothers Lucky Skott Drunk on Woodford: Count yourself lucky if you got a taste of this wee heavy aged in whiskey barrels from Woodford Reserve. Sweet, warm, boozy, good. Manhattan Project Plutonium 239: Named for the primary fissile isotope used to make nuclear weapons, this coconut porter (or was it a stout?) displayed great balance between the sweetness of the toasted coconut and the bitterness of the dark malt-based grain bill. Mossberg Whiskey Drank: It can't be a bad thing when you keep changing your mind about what beer you think might be the best you've ever had from a particular brewer. This time around it was Whiskey Drank that got my attention from Mossberg, with barrel aging adding a wonderful natural vanilla character to the sour brown base. The Seventh Tap - The Last Brunch: A big breakfast stout (12% ABV) that led with rich notes of maple syrup, followed by flavors cinnamon, dark chocolate and vanilla. Also notable: Bleshoux Golden Stout, Dallas Homebrew Collective Pilsner, East Dallas Black Honey Ale, Grotto Experimental IPA, Mox Nix Texas Breakfast Stout, The Seventh Tap Faux, Trunk and Commerce #16 Brett IPA. Like many breweries have done in recent history, Texas Ale Project opted to go the mobile canning route when it made the decision to offer its products in cans for the first time in November 2015. The idea, of course, being that the convenience of the mobile option allows a brewery to get packaged beer on the market without having to pay the upfront cost of an in-house canning line. For T.A.P., though, the purchase of something more permanent was always in the long-term plan. And now, with the delivery and installation of a new canning line in April, not only is it a plan that has come to fruition, it's also one that means more packaged products are in store for fans of the Dallas-based brewery. First off the line will be T.A.P. 's year-round double IPA, 100 Million Angels Singing (9.2% ABV, 100 IBU), with cans appearing on shelves in mid-May. Brewed with Simcoe and other hop varieties, the beer's "smooth, yet robust hop profile...offers notes of pine, resin and citrus." Following that this summer, the brewery will can Payne Pils (5.5% ABV, 31 IBU), a Czech-style pilsner that fits the mold of a Zwickelbier in that it's served unfiltered. The beer, which was first introduced at T.A.P. 's first anniversary party, is the first lager to come out of the brewery and one that's crafted in a traditional manner with a recipe consisting of Pilsen malt and Czech Saaz hops. According to a press release, the new canned offerings will be available for purchase in Dallas, Tarrant, Collin, Denton and the newly-added Johnson County. A launch party for 100 Million Angels Singing is also in the works, with that event to be held at the brewery on May 27. Image Credit: The Manhattan Project Beer Company. A name familiar to many in the homebrewing community, The Manhattan Project Beer Company has revealed that it will begin commercial production in October 2016. Karl and Misty Sanford first teamed up with fellow founder Jeremy Brodt in 2010. At the time, the goal was simply to design a special beer for Karl & Misty's wedding, but after working together the group found it had a unique sort of synergy that led it to formally establish The Manhattan Project in 2013. Since then, the trio has gone on to win over 25 awards at local, regional and national homebrew competitions for both Belgian and American-style brews, including a version of the beer that started it all, a Belgian-American brown ale known today as Inception. As for how The Manhattan Project will get its beer on the market, the company has entered into an alternating proprietorship with Bitter Sisters Brewing Company. 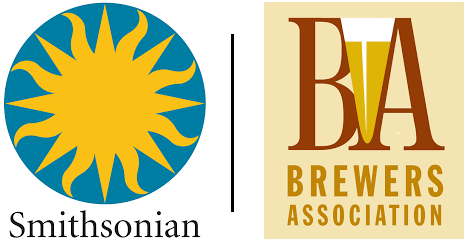 Like other similar agreements, this essentially means the two companies with both be licensed to brew at the facility presently occupied by Bitter Sisters in Addison. Of course, this won't all happen for another few months, but that doesn't mean you can't get a taste of what the company is all about a little sooner. The Manhattan Project plans on offering free samples of its products at events around the city between now and October, with one chance occurring this Sunday, May 15, at Brew Riot in the Bishop Arts District. 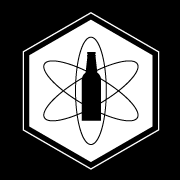 For more information on The Manhattan Project, follow the company on social media (Facebook, Twitter) or visit its website at www.manhattanproject.beer. Image courtesy of Grapevine Craft Brewery. 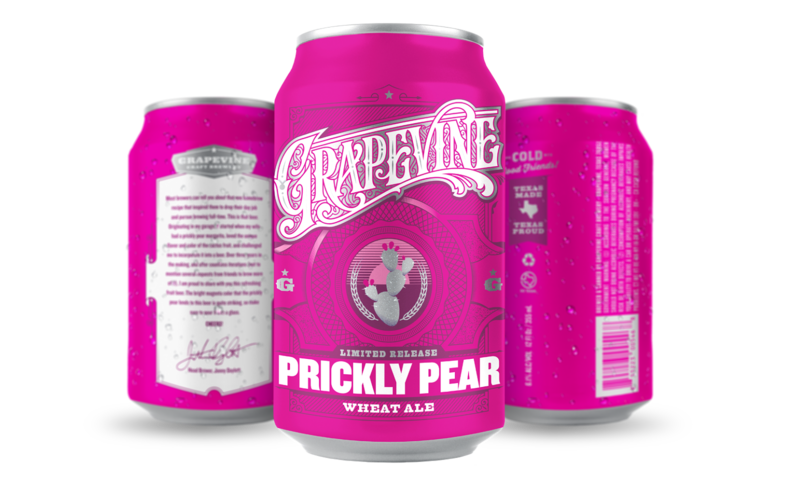 A product nearly four years in the making, Grapevine Craft Brewery has announced the release of its first fruit beer in the form of Prickly Pear Wheat. The creation of head brewer, Jonny Daylett, Prickly Pear Wheat has a bit of history around the homebrewing community. As far back as 2012, a version of the beer known as The Pear Necessities made the rounds at events under the umbrella of the Daylett Brew Company. Later, Daylett and the beer's recipe would become part of the plans behind Frisco City Grainworks, a startup slated to open in late 2014. When that didn't happen, Daylett made his eventual move to Grapevine, where the beer will now live on as a limited commercial release. As for what consumers can expect, Prickly Pear Wheat is brewed with real fruit puree to give it a "vibrant and striking magenta color." It's a beer of moderate strength, given an ABV of 6.1%, and one the brewery says is "summer drinking at its finest." 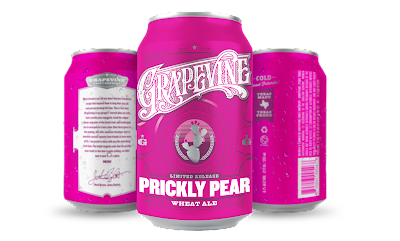 According to a press release, Prickly Pear Wheat will be available on draft and in six-packs of 12-ounce cans beginning in June. Additional limited offerings will follow, including Tropical Double IPA with Blood Orange and Mango (draft and package), and Brewers' Reserve Tart Cherry Berliner Weisse (draft only). All images the property of Big Bend Brewing Co.
Just shy of a year after first expanding its distribution footprint to include areas around Austin, Big Bend Brewing Company of Alpine is now ready to launch its West Texas-inspired brand of beer here in North Texas. Beginning the week of May 9, FullClip Craft Distributors will begin deliveries of Big Bend brews to draft accounts around the Dallas-Fort Worth area. Initial shipments will be limited to kegs, with packaged products arriving on retail shelves around mid-June. Tejas Lager, the brewery's flagship beer, as well as other year-round and seasonal selections will be available locally. Once on the market, consumers can expect to find all five of Big Bend's year-round offerings, including Tejas Lager, Big Bend Hefeweizen, La Frontera IPA, Number 22 Porter and Terlingua Golden Ale, as well as the brewery's latest seasonal, Balmorhea Imperial Berliner Weisse. 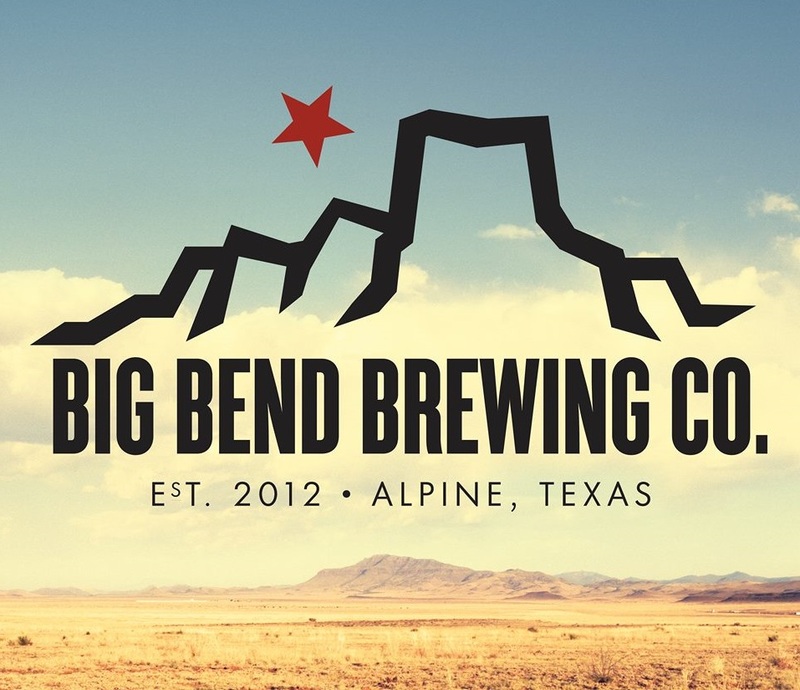 To help introduce Big Bend to North Texas, brewery representatives will be on hand for a series of official kick-off events, the first of which will be held on Thursday, May 12. Details on that and other festivities to follow are provided below. Taps & Caps, Lewisville - 5-8 p.m. - Meet the Brewer with Director of Beer Operations, Jan Matysiak. The Rustic, Dallas - 8-10 p.m. - Big Bend Launch Party. Magnolia Motor Lounge, Ft. Worth - 4-7 p.m. - Big Bend Brewing Co. Happy Hour. Reata Restaurant, Ft. Worth - 5-7 p.m. - Big Bend brews on the rooftop. Katy Trail Ice House, Dallas/Plano - 10 a.m. - Big Bend beers featured throughout the day. 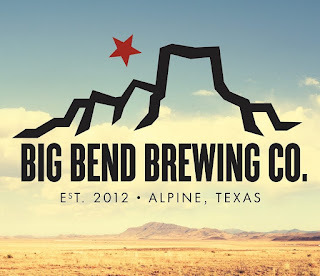 For more information on the brewery and its beers, visit Big Bend's website at: http://www.bigbendbrewing.com.